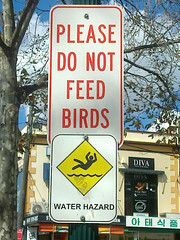 Signs in Strathfield telling the public to refrain from feeding the pigeons to avoid creating water hazards. Of course, that might not be exactly what they meant when putting up the signs. This entry was posted in Humor, Photos and tagged bird, hazard, humour, photo, sign. Bookmark the permalink.